On February 10th and 24th, over 140 Notre Dame students from various majors participated in a Financial Modeling workshop co-sponsored by the Notre Dame Institute for Global Investing (NDIGI) and the Wall Street Club (WSC). These students gained practical hands-on experiences in Discounted Cash Flow (DCF) models (Feb. 10th) and Leverage Buyout (LBO) models (Feb. 24th) from recent Notre Dame graduates working in investment banking or credit hedge investing. These financial modeling workshops are critical for students who hope to pursue careers in financial services. Many students across the country interested in investment banking typically spend around $300-400 on financial modeling training offered by third party organizations. By partnering with NDIGI, the Wall Street Club was able to create a series of Saturday workshops to provide financial modeling skill training for freshmen and sophomores at no cost to the students. The Saturday workshops were planned, designed, and executed by four WSC senior leaders who volunteered their time to ensure the workshop concentrated on experiential learning. 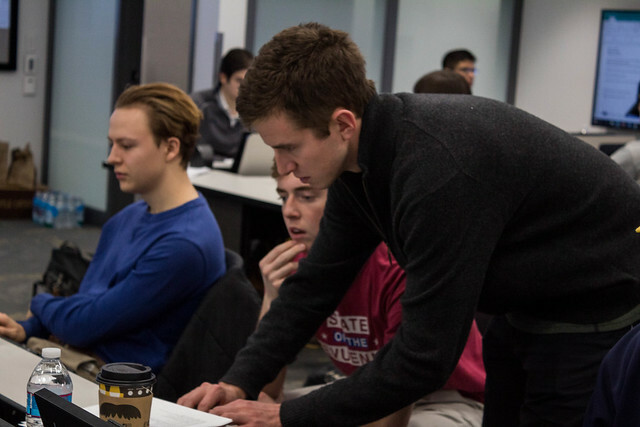 By taking time out of their academic lives and dedicating two Saturdays to these workshops, the WSC seniors fostered a community that values peer-to-peer mentorship by preparing younger undergraduate students discern careers in finance. Not only did the WSC senior leaders help build the spirit of the Notre Dame community, but the recent Notre Dame alumni practitioners also served to further promote partnerships within the alumni network. LBO practitioner Bryan Hall ‘17 emphasized how he believes that “the Notre Dame family stays with you after you graduate.” The fact that these professionals value helping future Notre Dame alumni proves that the Notre Dame family is very active and involved in preparing the next generation of students to find their niche in their post-graduate careers. These skills taught in the modeling workshop will place Notre Dame students at an advantage in financial services careers. Not only did the students present receive the models, every student on the Wall Street Club’s email list received the models so that they could also have the opportunity to practice. Through the dedication exhibited by the WSC seniors and recent Notre Dame grad practitioners, Notre Dame students were given an advantage in financial service careers. Alessandro DiSanto ‘15, Private Equity Associate at GTCR LLC.